On behalf of Admin of JML Law, A Professional Law Corporation posted in Bus Accident on Wednesday, Aug 22 2018. When you get on a bus to get to work or head out on vacation, you expect a safe ride, but bus accidents are much too common in California, as are the injuries they cause. The good news is, bus companies can often be found liable for any injuries you sustain as part of the accident. The bad news is, you and your bus accident attorney in Los Angeles only have a limited time to file a claim. When you’re injured in a bus accident, you need to act quickly to recover damages. If you are injured on a bus owned by a private company, you have two years to file a lawsuit against them. All buses are subject to the Common Carrier Rule, which holds them to a higher standard than the law would hold a friend if you were a passenger in their car. Passengers injured on public transit only have six months to file a claim if the bus company was at fault, with some additional time to file the lawsuit. Once that time is up, you’ve lost your chance to obtain compensation. What Is the Common Carrier Rule? Bus companies are expected to provide higher caution than other drivers on the road. Parties that offer public transportation are supposed to exercise a higher duty of care according to California state law. This duty is called the Common Carrier Rule. Common carriers are required to deliver safe transportation to passengers. If they don’t use foresight, vigilance, and human care to avoid harming passengers, then they are in violation of the law. It states they must use the care and vigilance of a very cautious person, as opposed to riding with a friend or family member who is only expected to use reasonable care to prevent harm. What Are the Differences Between Private and Public Bus Claims? When you file a claim against the bus company, you should know that a public bus lawsuit is a claim against a local government agency. Therefore, you have a shorter time period in which to file, and the claim works a bit differently. To be eligible for compensation, you must first file a claim with the bus company responsible for your medical issues. If they deny it, your bus accident attorney in Los Angeles can then help you file a lawsuit as soon as possible. If you were hurt on a private bus instead, your claim will be against a private entity, and you’ll have a full two years from the date of your injury to file. Any longer, and you’ll lose your right to recover damages. Who Do You Sue If You’re Injured in a Bus Accident? 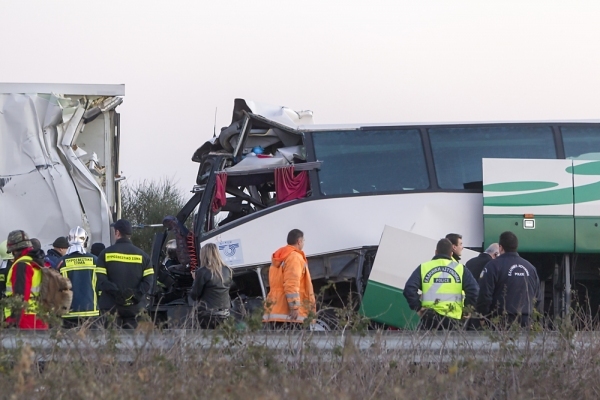 When you get hurt in a bus accident, it’s easy to assume that it’s simply the driver who’s liable. However, there are other parties who might be at fault. For example, buses must be regularly maintained. If they’re not, the irresponsible party may be held liable. If they have been maintained, but the mechanic was negligent or didn’t exercise proper care, they may be liable for the accident as well. Part manufacturers and those that build buses can also be responsible for your injuries if the design or manufacturing process was defective. If you were injured in a bus accident, it’s imperative to speak with a bus accident attorney in Los Angeles as soon as you can. JML Law can help you recover the compensation needed to pay your medical bills and reimburse you for lost wages and emotional trauma. Call us at 818-610-8800 to discuss your case in a free initial consultation.